A Mexican immigrant cooking Thanksgiving and Hanukkah on the same night in the cold Eastern region of the United States may sound a bit odd to some. For me, it turns out to be an unexpected opportunity to bring all my pieces together. Which has my mind reeling about the just as unexpected possibilities for the menu. See… ever since I can remember, I have felt like I am treading between worlds. The Mexican. The Jewish. The immigrant in the U.S. Not from here, not from there. Yet, as time goes by, the different parts of my identity feel increasingly solid, in all those worlds and their intersections. It turns out that where those intersections make the most sense is in the kitchen. I admit, though, that I am a hopeless romantic. That’s why every year when my husband asks what I want for my birthday, I say: the most passionate love letter, ever. Haven’t seen it, since he has seen me everyday in one way or another for the past 17 years. So, when my birthday comes close, I offer to pack my bags and leave, just to pretend… so he can write that super duper passionate love letter. That romantic nature of mine may be why little things mean a lot to me. Remember when 12/12/12 happened? I was wild about the beauty of the 1,2,1,2,1,2 pattern and the chances of that happening again being zero. Of course, realists immediately pointed out the fact that every single day in the calendar will never, ever, be repeated again. Yet, it is the highlighted uniqueness of the 1,2,1,2,1,2 pattern that brings us the opportunity to realize just how precious that day, and any other day, is. No surprise, then, that I am beyond ecstatic about Hanukkah and Thanksgiving happening at the same time. The chances of that happening again are so few and far in between (the next time, in 2070, it will be pretty likely that neither I nor Daniel will be here, so that is another reason for getting to that love letter) that it allows us to see these holidays under a different perspective: an enhanced sense of light, an expanded feeling of gratitude, a new vision of what sharing at the table can mean, a new chance to continue to build bridges, and what’s best, we can eat it all along the way. 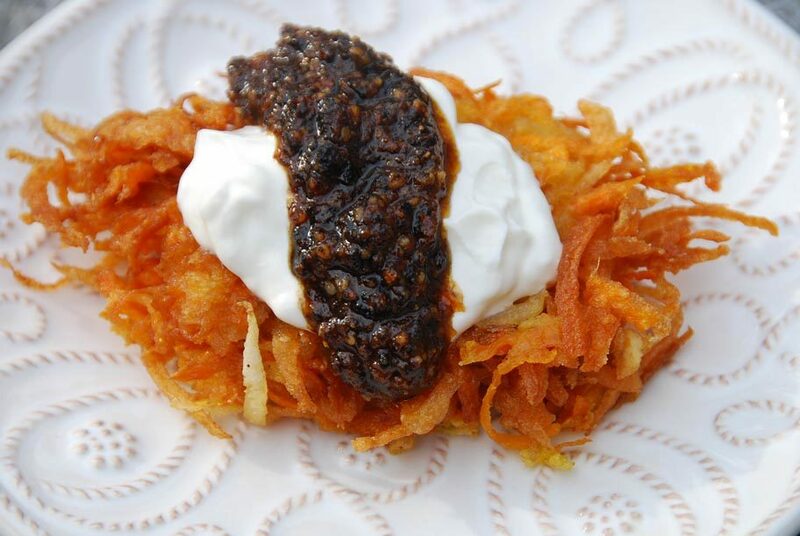 One dish that I came up with, for this once in a lifetime meal, are these Potato, Sweet Potato and Granny Smith Latkes. It is a recipe that has no fuss. It lets these three ingredients shine through and, at the same time, complement each other with the help of a bit of ancho chile powder and true cinnamon. You can choose to eat them just like that, on their own, or you can serve them with a thick, chunky, fresh and citrusy Fennel and Lime Crema or with this rustic and nutty Salsa Macha. Here’s a thought: you can do what I do. Eat them on their own as I am cooking them, and then eat them with both the Crema and the Salsa Macha once they are at the table. Wash and peel the potatoes, sweet potatoes, apple and onion and grate them, placing them as you go, into a large bowl filled halfway with ice water. After you are finished, let it all sit for a few minutes and thoroughly drain with a strainer. Wrap all the grated ingredients in cheesecloth or a clean kitchen towel and wring energetically, squeezing out as much liquid as you can. Transfer to a bowl and combine with eggs, ancho chile powder, salt, cinnamon, baking powder and flour. Mix well. Cook until the first side is crisp and golden brown, about 4 to 5 minutes, and flip to the other side, letting it crisp and brown as well, about 3 to 4 minutes. Transfer to a wire rack set over a baking sheet. Once you are finished, you may keep them warm in a 250-degree oven, or you may cover and reheat later on. Hi Pati. I’m such of fan of yours. I cant wait to make this! Your recipes are amazing. I also really enjoy reading all your stories to each recipe. Thank you for sharing. Thank you so much, Maribella! Querida Pati: esta receta se ve y suena deliciosa; voy a prepararla. Pero, me parece que te vi haciendo tamales dulces y no encuentro la receta…estoy equivocada? Si tines una te agradeceria si me regalas la copia. Soy Colombiana y los hecho de menos ya que llevo muchos, pero muchos anos en este pais. A proposito tango tus libros y me encantan. I just viewed on PBS your delicious recipe for smashed potatoes. I looked on your website for the details in a recipe, but no luck. would you let me know where I can the recipe on line on your website. Thanks so much. I am eager to put into my cookbook and experiment. I love watching your show. I do not like hot or spicy foods. In fact I ask when I go out to dinner what the least hot spicy food is and proceed to tell them I have the sissiest taste buds in the world. I have enjoyed your recipes very much. I have made several desserts, the Flourless Almond Torte, and I did not have any Porto…I used Amaretto instead.It was so simple and delicious, I made 3 of them in one day! I made the cake you made for your husband’s Birthday. I just watched you make the red rice and prawns. I don’t like prawns but the red rice is a great idea! I love your enthusiasm and enjoy watching you cook. I wonder how you do not get dirty or mess up your pretty outfits when you cook? I am glad to see that you do chop and cut and prepare your own ingredients. I have a friend who lives in Texas who kept me supplied in Mexican Vanilla, until recently. Since I ran out, I decided to make my own. I made a quart of each- Madagascar Bourbon Vanilla, Madagascar Rum Vanilla, and Madagascar Vodka Vanilla. It is good but I am going to ask Rose to send me some good Mexican Vanilla You are right- it is the best. I enjoy you, and your show very very much!Keep up the enthusiasm. It is contagious. In a good way. Hola Pat, Thank you for taking the time to write me such a lovely message!! I am happy you are finding plenty of recipes that you enjoy and are not spicy — in any that do have chiles, you can always remove the stems and seeds to make them less spicy or use less. Your home made homemade vanilla sounds so interesting!! Hola Lupita! Si! I am on Pinterest, look for me there, under Pati Jinich. Wondering if I can make these without the leavening and replace the flour with Matzo meal. Might just have these Monday for Passover! 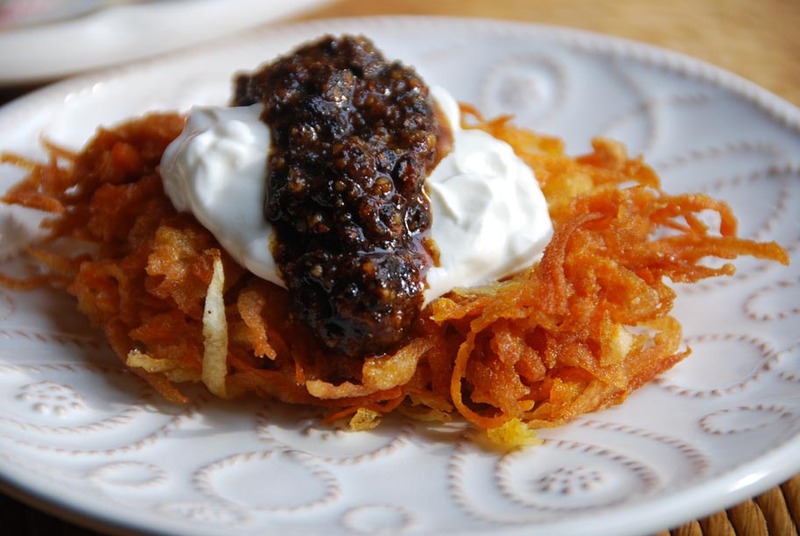 I think your idea of adding Apple to your Latkes is genius. 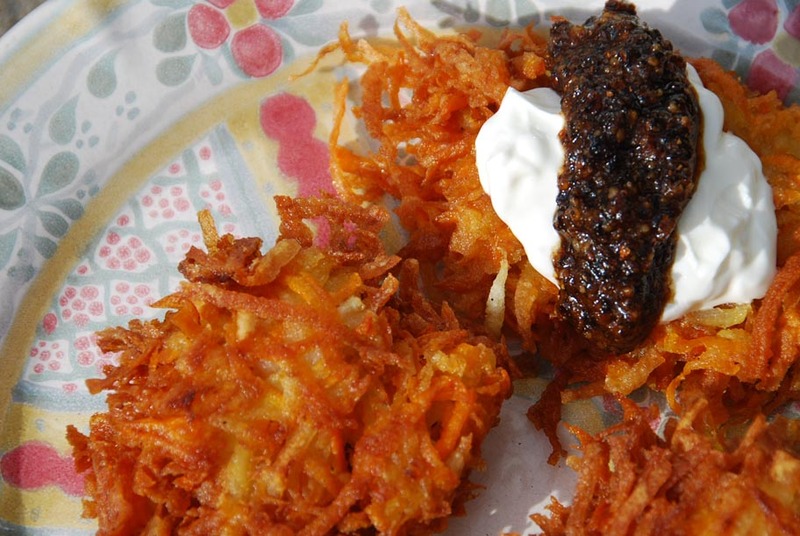 I love potato Latkes and have had them both with Applesauce and Sour Cream. Putting apple in with the potato is so smart. Then I could still do the sour cream or Creama and not look like Im loading the boat…LOL Thanks so much for ALL your recipes. Looking forward to trying them all…. I just discovered your blog and I am delighted! I’ll try to make this specialty tonight! Thanks for your comments! Delighted to hear you like the latkes, and YEY: please stay tuned for Season 3! Donde encuentras las moldes para los cochinitos? No los encontramos. Buscalos en tiendas de reposteria o online! I made, or attempted, to make these tonight as a pre-holiday run through. Did you measure the ingredients you specified? I used the exact amounts, weighed, you called for of potatoes, sweet potatoes, apple, and onion. I substituted chipotle chile powder for ancho, but otherwise followed your recipe exactly. The potato mixture was MUCH too dry with that amount of batter to begin to hold together. I mixed a second 1/4 cup flour with two MORE eggs, and still didn’t really hold together (though it tasted delicious). I put the rest of the mix on a quarter sheet pan, lined with foil and sprayed with coconut oil to “pan fry” in the oven at 400. Planning to flip that and cut into squares so they are a sort of rosti/latkes. I’m a very experienced cook and have been making latkes since childhood (I’m 60). Great idea, but the recipe as written needs to be adjusted. Sorry to hear this but happy to hear you liked the taste! These measurements worked great for me. However, that is how I am used to eating my latkes, with barely enough egg and flour, so that the latkes are really crispy, almost airy and less like patties. What an interesting combination of flavors that must be on my table very soon. And I’m pretty sure when I serve it that lime/fennel crema is a must. Thanks for a great recipe. pati, the latkes sound wonderful; and I will make them, for sure. and HAPPY HANUKKAH. I hope you get that letter! your writing is very touching, and so universally true. loving your cookbook!